Invisalign in Friendswood is an FDA-approved, clear alternative to metal braces. It works using a series of plastic aligners made just for your smile. Over the period of one year, on average, the trays place focused pressure on different teeth to gradually shift them into the proper position. 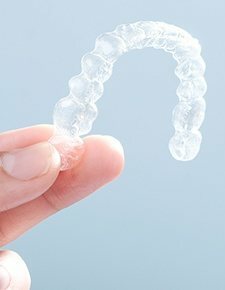 The best thing about Invisalign? It’s practically invisible -- so you can continue to speak and smile with confidence throughout your orthodontic treatment. 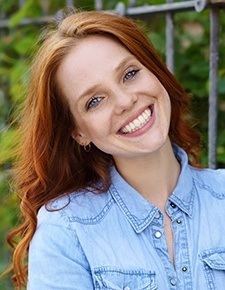 Invisalign corrects the most common orthodontic issues, including gapped and crowded teeth as well as overbite, underbite, and crossbite. To set you up with your Invisalign treatment, your doctor at Friendswood Dental Group will take photos, x-rays, and impressions of your teeth. With 3D images of your mouth, he will put together your treatment plan and tell you how long you can expect your treatment to last. Adults, on average, wear Invisalign for one year. After your Invisalign trays are created, they’re shipped directly to you. You can begin treatment immediately. The Invisalign aligners are made of smooth, comfortable, and virtually invisible plastic. Wear each aligner for approximately two weeks before advancing to the next in the series, gradually advancing your way to straighter teeth and a more confident smile. After you have completed your Invisalign treatment, you can keep your beautiful results by wearing a Vivera retainer as directed. It’s created using the same materials and technology as your Invisalign aligners, so it is an easy transition to protect and maintain your straight, beautiful teeth. Compared to bulky, uncomfortable metal braces, the Invisalign treatment is a breeze. Both options reveal the same results -- straight, properly aligned teeth -- but your experience throughout the Invisalign treatment is much easier. Removable aligners allow you to continue eating what you like. Brushing and flossing is as easy as before braces with removable Invisalign trays. Smooth plastic is far more comfortable than metal brackets and wires. Fewer visits to the dentist are required with Invisalign. For its convenience, efficiency, and reliable adults, busy adults agree that Invisalign is the clear choice in orthodontic treatment. Wear your Invisalign trays for the recommended 20 to 22 hours every day to advance through your treatment on time. When you wake up, brush and rinse your aligners and your teeth. Remove the aligners before each meal and snack, and continue to eat all of your favorite foods without worrying about damaging your braces. If you play sports, you won’t ever accidentally injure your soft tissues on a metal bracket or wire. And when it’s time for bed, just clean your aligners, and brush and floss your teeth -- without having to worry about any tricky maneuvering around wires and brackets. Are you interested in benefitting from clear braces? Your dentist in Friendswood can’t wait to discuss Invisalign with you. Please get in touch with us today!